I was researching the folklore of dogs recently and came across a good, short article to share with you: "Black Dogs: Guardians of the Corpse Ways" by Bob Trubshaw (posted on the At the Edge website). "The dog is the oldest domestic animal," writes Trubshaw, "traceable to the paleolithic, since when dogs have enjoyed a peculiarly close relationship with humans, sharing their hearths at night and guarding the home, working during the day as sheepdogs or hunters. This close symbiotic relationship with people is reflected in the early literature where dogs seem to have clear connections with the Otherworld. But this is not unique to hounds as many species from bulls, boars, to owls and cuckoos have clear associations with deities which lead to ritual veneration. However, archaeological evidence and mythology brings recurring examples of a very specific role for dogs. 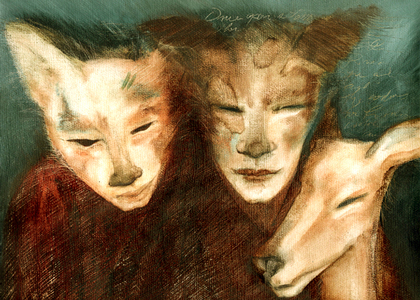 They are the 'psycopomps', the guides on the paths to the Otherworld, the guardians of the 'liminal' zone at the boundaries of the worlds...."
If you happen to be looking for a more in-depth study of dog mythology, try David Gordon-White's wide-ranging, fascinating book Myths of the Dog-Man, from the University of Chicago Press. The Mythology of Dogs by Gerald and Loretta Hausman is also a good source of information on dog lore from around the world. "Johnson takes a relatively simple idea -- that animals have gained the ability to speak -- and takes readers into an emotionally charged arena that is wholly unexpected and exhilarating. Once I realized the hook for this story, I thought it might be funny in a wry or maybe even sophisticated sort of way, but I didn’t think that Johnson would be able to touch my heart so deeply....'The Evolution of Trickster Stories' is a perfect story for classes on the modern short story; it conveys an amazing amount of powerful emotion in such few words and in a truly uncanny way." I recommend reading Colleen's full review (over on the Bookslut website), in which she also looks at dog tales by Nick Abadzis (Laika) and Charles de Lint (Dingo), as well as a reptile novel by Wendy Townsend and animal poetry from Marjorie Maddox. 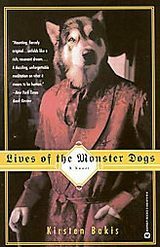 Kristen Bakis' novel Lives of the Monster Dogs is a Frankenstein-like story about a race of dog-people, designed by a mad scientist, now living in New York City. I loved the wacky premise, but didn't find the book itself entirely successful...Ellen Datlow loved it, however (as did many other people), so it's definitely worth checking out. On the mainstream shelves, I was impressed and occasionally unnerved by the hard-hitting stories in Brad Watson's Last Days of the Dog-Men. Despite the fanciful title, this is a collection of realist stories with just a tinge of surrealism at the edges...but don't miss it if you're a dog lover, or simply a fan of fine contemporary writing. 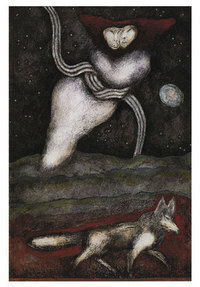 Art credits: The painting at the top of this post is from my Desert Spirits series, called "Coyote and the Dog Spirits." The second painting is by Meinrad Craighead, who often uses dog symbolism in her deeply spiritual and mythic art, which has been collected in a beautiful volume titled Crow Mother and the Dog God. 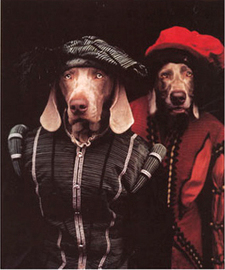 The photographs on the left are "Old Dogs" and "Macbeth" by the dog-obsessed artist William Wegman. Visit his website to see more of his work. (There's a cool little flash movie on the homepage.) 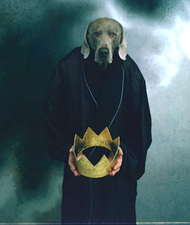 For more dog lore and art here's a link to to our previous post on the subject: Magical Dogs. 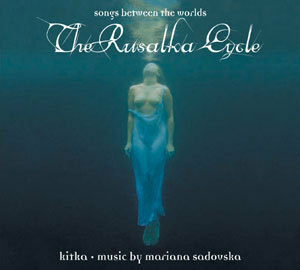 It' s sort of a Rusalki morning for me, for in addition to mentioning Kitka's performance of The Rusalka Cycle (below), I also want to alert our readers to a gorgeous new book of Slavic folktales, Rousalka, Et Autre Fées du Mille et Unième Lac (Rousalka and the Fairies of 1001 Lakes), due out in France sometime soon. (Sorry, no publication date available yet.) The collection is a joint project between author Damien Vaillant and illustrator Agata Kawa, whose work is just absolutely wonderful -- a mixture of 19th century craft-style illustrations with a dash of Kay Nielsen, Rackham, and William Morris. 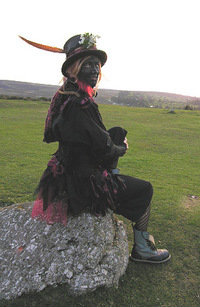 Do have a look at her beautiful MySpace page, Portfolio, and website to see more of her art. 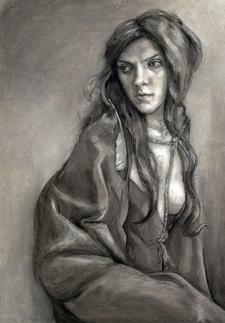 "In Slavic Folklore, Rusalki are the restless spirits of women who have died unjust, untimely, or unnatural deaths. They inhabit the waters, forests, and fields, luring people to them with their mesmerizing songs and wild laughter. Performed by the nine powerful female vocalists of Kitka, together with percussionist Loren Mach and cellists Jessica Ivry and Myra Chaney, The Rusalka Cycle is a riveting, dream-like journey that weaves traditional Eastern European folk song and ritual together with original music by Mariana Sadovska in a haunting and evocative contemporary theater production directed by Ellen Sebastian Chang. "Our re-imagined 2008 production features new costumes by Valera Coble, lighting design by Jack Carpenter, sound design by Cuco Daglio, beguiling new characters, and many dramatic moments previously unseen." It's also worth noting that even if you can't see the show, the CD is available from the website. 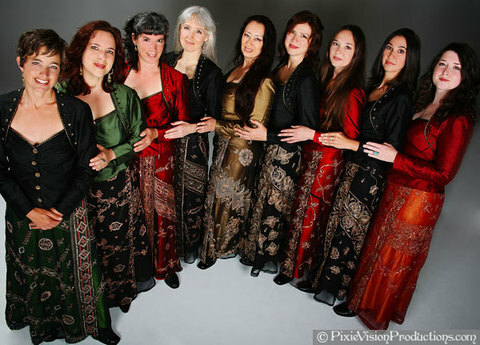 And do, do, do stop by their MySpace page to hear some of their gorgeous singing. 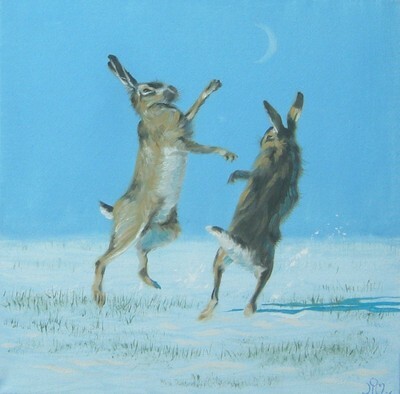 For more on the local mythology of hares, check out the Three Hares Project on Chris Chapman's website, and my article on hare and rabbit lore from around the world. The Guardian newspaper in the UK challenged three writers -- Hilary Mantel, Chimamanda Ngozi Adichie, and Audrey Niffenegger -- to create new fairy tales "fit for the 21st century" for the Children's section of the paper. You can read the results here. Okay, dear readers, what are your thoughts about this "challenge," and about the stories themselves...? The art in this post is by the wonderful Julia Jeffrey, who lives in Scotland. You'll find more of her work on her MySpace page and in the Endicott/JoMA gallery. I've been enormously excited about Kate Bernheimer's new book, Brothers & Beasts: Men on Fairy Tales," since I read the review galleys some months ago, but I felt it would be cruel to burble on about it here before it was published and you'd be able to lay your hands on a copy. Now, at last, the book is out and I can burble to my heart's content. Kate (editor of The Fairy Tale Review) created the book as a companion volume to her excellent collection Mirror, Mirror on the Wall: Women Writers Explore Their Favorite Fairy Tales, which contained essays from the likes of Julia Alverez, Margaret Atwood, bell hooks, A.S. Byatt, Kathryn Davis, Chitra Bannerjee Divakaruni, Ursula Le Guin, Fay Weldon, our own Midori, and many others. She started work on the new book, she says, by writing "to authors whose work I felt owed something -- whether overtly or mysteriously -- to fairy tales. It was difficult to pare down the list, but I approached writers who work in a range of forms -- poetry, essays, memoir, novels. I made no discrimination between those writers considered 'literary' and those considered 'popular,' nor between those considered 'experimental' or 'mainstream.' I felt that such categories have little to say to the fairy-tale tradition, a tradition so open and varied, as friendly to abstraction as to precision, as friendly to mice as to men. "I asked these writers, 'Would you be interested in writing a personal essay about fairy tales for a collection?' That was the invitation. I wanted the invitation to be as open ended as a fairy tale that begins, 'Once upon a time...' and then goes somewhere surprising, unknown." The book contains 24 delicious essays by Steve Almond, Robert Coover, Ilya Kaminsky, Eric Kraft, Norman Lock, Gregory Maguire, Timothy Schaffert, Vija Seshadri, and many others. Richard Siken gives us a gorgeous riff on Hansel & Gretel, woodlands and witches. Jeff Vandermeer discusses the significance of the "third bear" lurking in the forest. 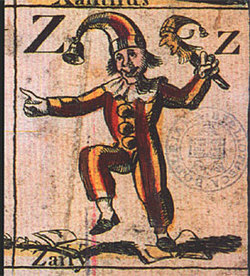 Johannes Goransson ponders the relationship between folklore and modern Swiss poetry. Greg Bills considers the deeper meanings to be found in Jack and the Giant. 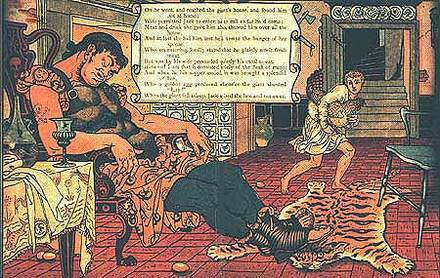 Neil Gaiman reverts to poety to express his strong connection to the fairy tale tradition. My favorite essays (although it's hard to pick just two in a book so filled with gems) are by Christopher Barzak and David J. Schwartz. Chris deftly uses a Grimms' fairy tale, "The Story of the Youth Who Went Forth to Learn What Fear Was," to evoke the particular flavor of a working class childhood in the Midwest, while David turns The Bremen Town Musicians (of all things!) into a lovely coming-of-age memoir. And as if all this wasn't enough for your money, the book also includes a forward by Maria Tatar and an Afterwards by Jack Zipes, two of the most distinguished fairy tale scholars working today. Kate's own introduction is also a treat, particularly when she discusses the differences between editing Mirror, Mirror and Brothers & Beasts. 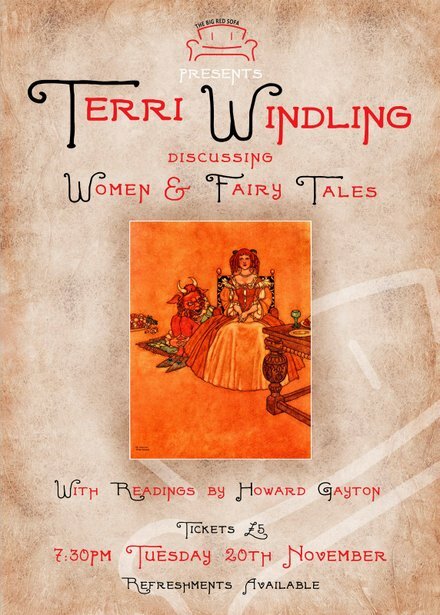 For many thousands of years, storytellers have drawn upon fairy tales to create fictions relevant to their own times, making use of their symbolic language to explore issues of gender, class, justice, power, and cultural identity. The twenty-four writers in Brothers & Beasts make it clear why fairy tales are still important to a wide range of storytellers today. Their essays are both whimsical and scholarly; both archly provocative and deeply moving. This superb collection demonstrates the ways that stories read in childhood continue to shape us as adults and why many writers return to them long after childhood is done. I highly recommend Bluebeard's Wives, a collection of poems inspired by the fairy tale (what a great idea!) from twenty-four women writers. The volume is edited by Julie Boden & Zoe Brigley, and published by The Heaventree Press in Coventry. In the book's Forward, Sophie Hannah writes: "Bluebeard is an oddly incomplete story. Does Bluebeard only decide to kill his new wife because she has disobeyed him, unlocked the door and found the bodies of his previous wives? If she had done as she was told and steered clear of that room, would he have let her live? Does that mean that the reason he killed all his other wives was because they too wouldn't leave his secret room alone? Then why did he kill his first wife? As a writer and reader of psychological crime novels, I like to add this sort of plot detail to the story as it stands. 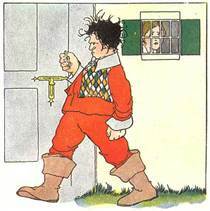 The great thing about powerful, archetypal stories is that they trigger our imaginations, which we then use to invent stories of our own. Each of the poems in this collection tells its own story, and each is a fascinating response to the original inspiration." Jo Bell, Roz Goddard, Jane Holland, Jo Roberts and other writers contribute terrific poems and poem sequences to this first-rate collection from the British Midlands. 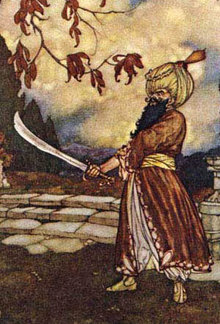 As for the fairy tale itself, although the story of Bluebeard is derived from older folk tales of demon lovers and devilish bridegrooms, the fairy tale as we know it today is the creation of French writer Charles Perrault, who published it in 1697 in his collection Histoires ou contes du temps passé. Perrault was one of a group of writers who socialized in the literary salons of Paris, collectively creating a vogue for literature inspired by peasant folk tales. These new stories were called contes des feés, from which our modern term "fairy tales" derives — but the contes des feés of the French salons were intended for adult readers, not children. 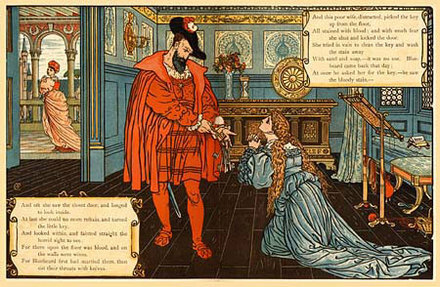 Bluebeard, as a good example, has little to recommend it as a children's story; rather, it's a gruesome cautionary tale about the dangers of marriage (on the one hand) and the perils of greed and curiosity (on the other). 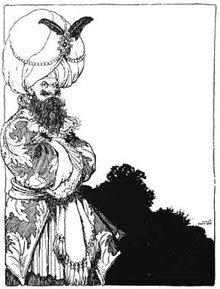 You can read more about the history of the fairy tale (and related folk tales such as Fitcher's Bird and Mr. Fox) in "Bluebeard and the Bloody Chamber" in our Articles section. I also recommend the following related books: Secrets Beyond the Door: The Story of Bluebeard and His Wives from fairy tale scholar Maria Tatar; and these Bluebeard inspired works of fiction: Fitcher's Brides by Gregory Frost, Blue Diary by Alice Hoffman, Bluebeard by Kurt Vonnegut, The Seven Wives of Bluebeard by Anatole France, and the title story in The Bloody Chamber, adult fairy tales by the late, great Angela Carter. 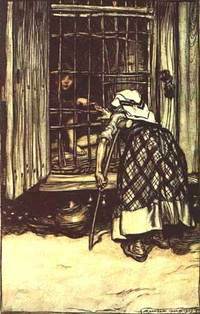 The art in this post is by Walter Crane, Charles Robinson, and Edmund Dulac. Although the prospect of traffic between the living and the dead has often been feared, some cultures celebrated those special times when doors to the Underworld stood open. In Egypt, Osiris (god of the Netherworld, death, and resurrection) was drowned in the Nile by his brother Seth on the 17th of Athyr (November); each year on this night dead spirits were permitted to return to their homes, guided by the lamps of living relatives and honored by feasts. In Mexico, a similar tradition was born from a mix of indigenous folk beliefs and medieval Spanish Catholicism, resulting in los Dias de los Muertos (the Days of the Dead) -- a holiday still widely observed across Mexico and the American Southwest today. Celebrations vary from region to region but generally take place over several days (or weeks) at the end of October/beginning of November. In some areas, October 27th is the day to put out food and water for the unmourned dead -- the spirits of those with no survivors and no homes to return to. On the 28th, food is offered to those who died by accidental or violent means; these gifts are also placed outside the home, to guard against malign spirits. Within the house, an ofrenda or offering is painstakingly assembled on a lavishly decorated altar. Food, drink, clothes, tequila, cigarettes, chocolates and children's toys are set out for departed loved ones, surrounded by candles, flowers, palm leaves, tissue paper banners, and the smoke of copal incense. Golden paths of marigold petals are strewn from the altar to the street (sometimes all the way to the cemetery) to help the confused souls of the dead find their way back home. The souls of unbaptized children ("infants in limbo") return on October 30th; on the 31st all other children return and are fed with the sweets and drinks that were known to be favorites of theirs in life. Adult souls return on November 1st, and theirs is a more elaborate feast, including gifts of new clothes and blankets or baskets to carry offerings away. According to Fredy Mendez, a young Totonac man from Veracruz, "Between 31 October and 2 November, past generations were careful always to leave the front door open, so that the souls of the deceased could enter. My grandmother was constantly worried, and forever checking that the door had not been shut. Younger people are less concerned, but there is one rule we must obey: while the festival lasts, we treat all living beings with kindness. This includes dogs, cats, even flies or mosquitoes. If you should see a fly on the rim of a cup, don't frighten it away -- it is a dead relative who has returned. The dead come to eat tamales and to drink hot chocolate. What they take is vapor, or steam, from the food. They don't digest it physically: they extract the goodness from what we provide. This is an ancient belief. Each year we receive our relatives with joy. We sit near the altar to keep them company, just as we would if they were alive. At midday on 2 November the dead depart. Those who have been well received go laden with bananas, tamales, mole and good things. Those who have been poorly received go empty handed and grieving to the grave. Some people here have even seen them, and heard their lamentations." You can read more in "Dusk, Dawn, and the Days of the Dead," an article in the JoMA archives; and you can see a compilation of Dia de los Muertos images from Patzcuaro, Mexico here. 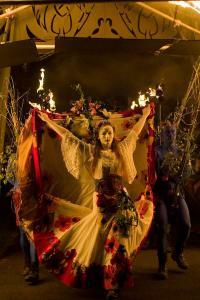 Tucson has a vivid "All Souls" celebration, which includes a costume procession, drumming, street altars, and the torching of an urn full of offerings and prayers. The little video above, discussing Day of the Dead holiday customs in Mexico, comes from Hooligan TV. The art at the top of this post comes from the website for Day of the Dead festivities in San Antonio, Texas.